The Pop Up Flea Rises | A Continuous Lean. Pop Up Flea returns for the 5th time. We’ve been working hard over the last few months to bring together a great group for a weekend of menswear fun in New York City. Expect to meet the people behind your favorite brands, get prepared to see exclusive products and plan on discovering something new at what should be the best Pop Up Flea yet. Dates and location information are below. A full vendor list will be announced shortly. 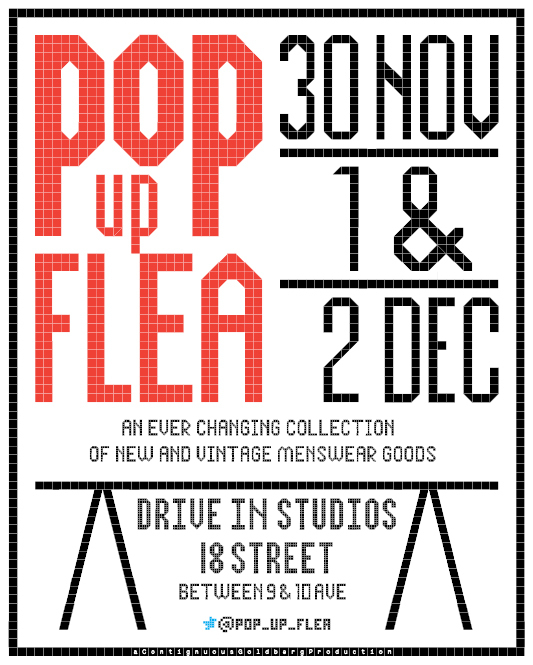 Mark your calendar, save the date and join us at Pop Up Flea 5. More on the history of Pop Up Flea here. I always look forward to the posts that follow these. cash only, like a true flea market? FB event link for this? @SB I’m sure all of the vendors will be using Square or some other form of remote card processing for the event. There are also usually ATM’s around the event space. When you guys going to bring this to the left coast, L.A. in particular…? When do you guys open on the three days?